What is a Survival Property? The term “survival property” or “prepper property” doesn’t mean an underground bunker stocked with firearms and freeze dried food guarded by Grizzly Adams. While it could be that, it is most often a modest getaway place tucked up in the western North Carolina mountains that is out of sight and out of mind. Its a place where you and your family can go to in times of civil unrest or natural disaster while you weather the storm. A survival property may encompass as little as five acres to well over two hundred. The dwelling thereon may be a modest cabin that is “off the grid” using solar power or a luxurious home with all the comforts one may desire. Its all about your lifestyle, budget and concerns for security. While the housing may vary, there are certain features of the underlying land that need to be incorporated in any survival property. These are features that will allow you to weather the storms of civil unrest or long term power outages. Some of these key features include a source of water, whether it be a surface stream, river, pond, or deep well. If the property doesn’t have one of these, then you can supplement it with water barrels or cisterns to collect rainwater from rooftops. Another feature is having some land on which you can grow a private garden. The amount of land doesn’t have to be in the tens of acres if properly managed. But it is important to have a replenishable supply of food for both you and possibly neighbors who are unprepared. A stand of timber is another resource that will come in handy as you’ll need a fuel source for heating a house when the power is out. Even if you have an underground storage tank of propane, it will eventually run out. 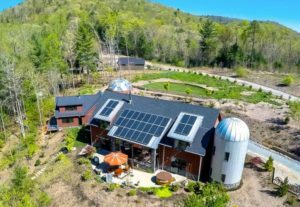 Of course one could incorporate an active solar system into the construction of the house to provide power. Another power source is that of micro-hydro electric generators that can be placed into streams to generate your own electricity. One of the main characteristics is that the property be out of sight from main traffic corridors. In the event of a major disaster or civil unrest, hordes of refugees will follow the major traffic corridors, stopping along the way scavenging for food, fuel and shelter. You will want to be several miles off any such corridor. Having a non-descript entrance to the property will further encourage refugees to keep moving past your place. The above are all items that will help you in selecting the right survival property. In the mountains of western North Carolina there are many such properties available and Retreat Realty is the professional choice for assisting you in your search. Contact us for more information.